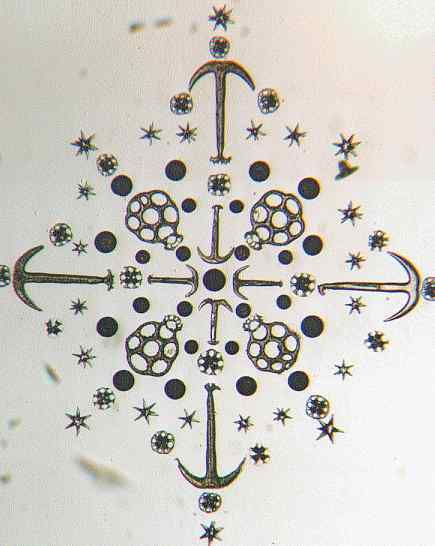 Spicules were common subjects for microslides. Looking through a copy of the 'Catalogue of Microscopic Objects' from W. Watson and Sons Ltd., 36th edition, I found seven different strewn spicule slides offered. 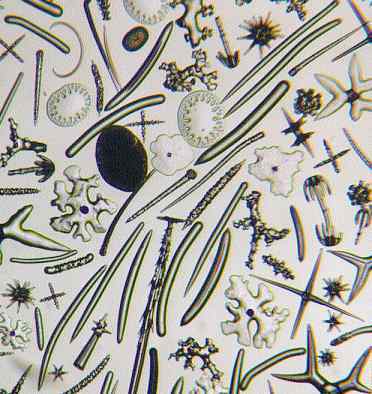 The following photomicrograph is such a strewn slide, showing the numerous variety of spicules that occur. It is a favourite of mine and I would dearly like to have such a slide in my own collection. Group of spicules of sponge, from St Peter, Hungary (Watson slide). Of course these slides are very much microscopical objects as they are only useful to a limited extent in illustrating the sponge itself. This is because they are isolated siliceous parts of the horny skeleton of certain organisms e.g. sponges and sea cucumbers. They vary in form greatly, but whatever the shape or form they serve the same purpose of strengthening the framework of the animal. When alive, sponges are composed of a firm, fleshy substance composed of tiny cells. The horny skeleton is developed in the inter-cellular substance, and within cells of horny matter these spicula are secreted. 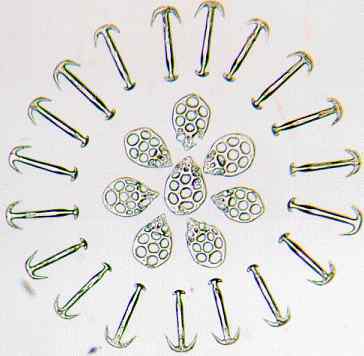 Just as microscopical slidemakers showed their skill and patience with arranging diatoms, likewise spicules were a favourite object for arranging into patterns. This is shown in the following two photomicrographs. I think this feat is exceeded in the next example. Perhaps readers who have experience of making such slides could get in touch to share their knowledge with others, perhaps even write an article for Micscape. All photomicrographs by Mike Samworth. If any reader wishes to ask about any of the above, or to comment, please do get in touch by Comments to the author sent via our contacts page quoting page url plus : ('msamworth','')">contacting me.